August Macke was born in Meschede, Westphalia, Germany, and received a classical art education at the Düsseldorf Art Academy from 1904-06. During his first visit to Paris in 1907 he became increasingly interested in French Impressionist painting, and after his return to Germany enrolled in Lovis Corinth’s art school in Berlin, one of the leading German Impressionist artists. After marrying Elisabeth Gerhardt in 1909, the couple spent a month in Paris, where Macke intensely studied the work of Henri Matisse and the Fauves. 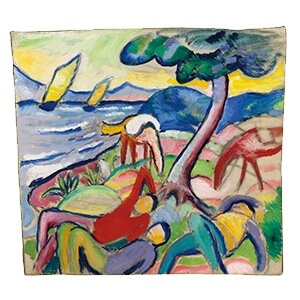 Shortly after moving on to Tegernsee in Southern Bavaria, Macke met the artist Franz Marc, who became a close friend, and introduced him to Wassily Kandinsky, Gabriele Münter and Alexej von Jawlensky. In 1911 these artists founded the avant-garde group Der Blauer Reiter (The Blue Rider), of which both Macke and Marc became members. In 1912,both men traveled to Paris, where they got acquainted with Robert Delaunay, a representative of Orphism. Macke subsequently introduced Cubist elements to his work, mostly visibly in his famous series of paintings he produced in Tunisia, where he traveled together with Swiss artist Paul Kleein 1914. By the fall of the same year, Macke was killed in action during WWI, aged 27.